I created the following graphic for my teaching of systematic theology. As is documented below the quotations come from Reformed theologian Anthony Hoekema. 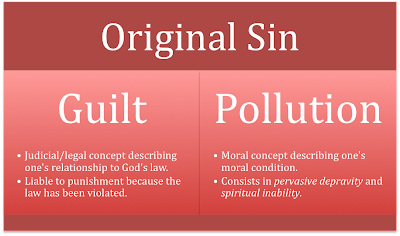 Original sin includes both guilt and pollution. Guilt is a judicial or legal concept describing one’s relationship to the law—in this case, specifically to God’s law. Guilt is the state of deserving condemnation or of being liable to punishment because the law has been violated. When we say that original sin includes guilt, we do not mean that each of us is considered personally responsible for what Adam did. You and I cannot be held directly responsible for something someone else has done. But the doctrine of original sin does mean that we are involved in the guilt of Adam’s sin because he acted as our representative when he committed the first sin. Pollution, in distinction from guilt, is a moral concept; it has to do with our moral condition rather than with our status before the law. 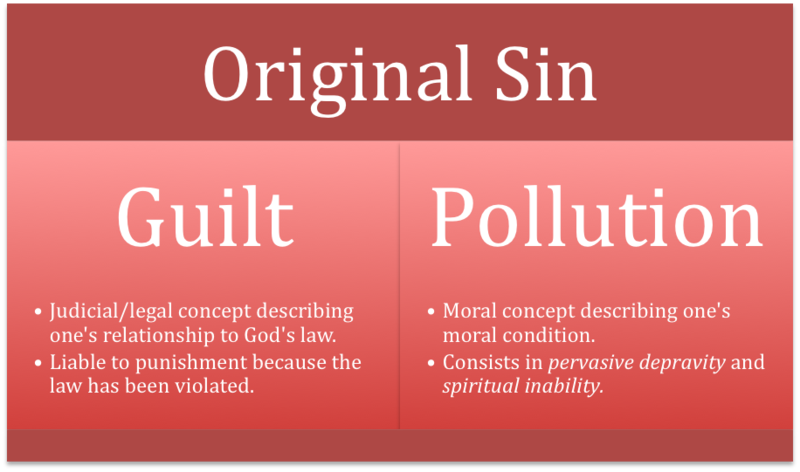 We can define original pollution (the pollution involved in original sin) as the corruption of our nature that is the result of sin and produces sin. As a necessary implication of our involvement in Adam’s guilt, all human beings are born in a state of corruption. We should distinguish between two aspects of original pollution: pervasive depravity and spiritual inability. · Pervasive depravity, then, means that (1) the corruption of original sin extends to every aspect of human nature: to one’s reason and will as well as to one’s appetites and impulses; and (2) there is not present in man by nature love to God as the motivating principle of his life. · Spiritual inability means two things: (1) the unregenerate person cannot do, say, or think that which totally meets with God’s approval, and therefore totally fulfills God’s law; and (2) the unregenerate person is unable apart from the special working of the Holy Spirit to change the basic direction of his or her life from sinful self-love to love for God. “Spiritual inability” is really only another way of describing the doctrine of “pervasive depravity,” this time with an emphasis on the spiritual impotence of the will. Taken from Anthony Hoekema Created in God’s Image (Grand Rapids: Eerdmans, 1986), 148-152.